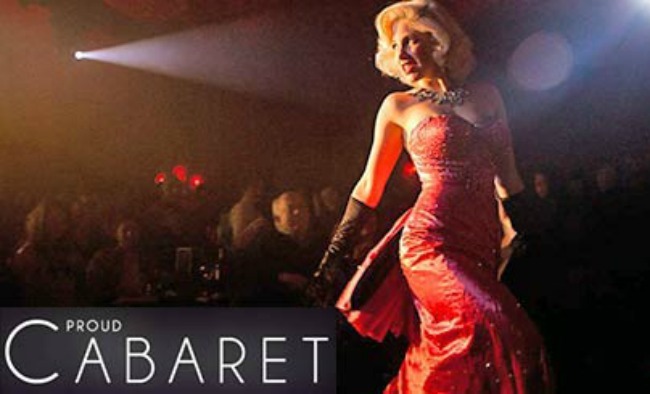 For glamour and decadence, Proud Cabaret provides evenings out which are difficult to beat – and Ciana and Tony (part of the RLD team) certainly agree. Ciana tells us it was like stepping into an underground 1920’s speakeasy. Read on for details of her big night out with Tony on a special offer available to 6 October 2014 only! “We wanted a big night out in London, and took advantage of a limited special offer, reducing the price of our burlesque dining experience by 33%. Even at the full price, this experience is a real bargain and we were not disappointed! After being greeted at the door by a hostess in full burlesque attire, we were shown to our front row table. We chinked glasses filled with a Kir Royale champagne cocktail, enjoyed the buzz of the already-full venue and sat down ready for our food. Seared Ribeye steak, tangy green peppercorn dressing, micro salad with Parmesan and truffle oil. Golden superfood salad with feta cheese, golden beets, butternut squash, spinach with honey and mustard dressing. The show was about to kick off so we enjoyed our English strawberry mousse with frozen yoghurt and shortbread whilst the line-up was introduced. The talented compère treated us to a couple of songs from the 60’s including ‘Can’t Take My Eyes off You’ by Frankie Valli. The performers were absolutely fantastic and the highlight of my evening was an ariel hoop act, where only the hoop and the performer’s own strength prevented a fall. The artist’s flexibility and strength was amazing and the whole audience was in awe, refusing to blink in case they missed anything. She contorted her body through the hoop to hang, pose and dance in mid air! There were more traditional burlesque performers, curvaceous women dressed to tease and impress, wearing costumes adorned with rhinestones, feathers and classic silk gloves. Pin-up 1920’s hair styles and bright red lipstick topped off the look. Betsie Bon Bon closed the show with a jaw dropping performance, dressed in clothes with the Union Jack and carrying a teapot, she danced her way around the stage, sprinkling the audience with glitter when removing her gloves! After the show, guests were invited onto the stage for the next few hours to dance the night away. Everyone was in such high spirits after eating delicious food and watching exciting acts, we all went for it”. Thanks for the insight Ciana. Clearly it was an evening to remember, and one we are very happy to recommend!